The all-inclusive Laguna Beach Hotel & Spa is nestled in the secluded South Eastern Coast of Mauritius just some 25 minutes drive from the airport. Designed for a modern yet rustic holiday experience, Laguna Beach hotel offers you a pleasant sojourn where you can savour the traditional laidback Mauritian lifestyle. Bordered by a turquoise lagoon on one side with breathtaking views of the Grand-Port mountain range on the other, this establishment is the perfect destination for an authentic and exotic stay in Mauritius where you can relax and enjoy the pleasant vacation atmosphere. Unwind at the main swimming pool, or keep on with your routine workout at the gym, and in case you wish to relax your body nerves then join for a rejuvenating moment at the SeaZan Spa Retreat. The hotel comprises 64 furnished bedrooms, each of them is sea facing and features a balcony or terrace with a unique a tropical architecture. Enjoy a range of complimentary activities such as: kayaks, glass bottom boat, snorkelling, beach volley and many more. Sega shows entertain guests on Saturday evenings and on Wednesdays they are entertained with different changing cultural shows. Sardinella Ristorante serves a themed dinner buffet; Wahoo Beach Bar & Grill serves seafood and provides a beach dinner twice weekly. Dorado Pool Bar offers snacks and afternoon tea. The spacious Family Room is ideal for families with children. The room is equipped with TV having local and satellite channels, free wifi, electronic safe, mini bar, and other amenities for your convenience. The Deluxe Room has an incredible sea view and offers comfort and intimacy. It has a 35m² space area, and is well-equipped with excellent room amenities. You can chill at your private balcony or terrace. Enjoy the comfort of the standard room with a beautiful sea view. It is equipped with a satellite TV, tea and coffee making facilities and a mini-bar. Please note no extra beds can be accommodated in this room. Sardinella Ristorante is the main restaurant which serves a themed dinner buffet with Mauritian specialities such as griddled fish, an ‘Indian corner’ with pungent curries, dahls and stews. Tantalise your taste bud with the various flavours of Mauritian cuisine. Wahoo Beach Bar & Grill serves seafood and provides a beach dinner twice weekly. Mouth-watering seafood menu, with refreshing drinks in a chilled environment await you. Dorado Pool Bar offers you variety of snacks, sandwiches, and afternoon tea. The Seazen Spa Retreat, offers you a plethora of massages ranging from exotic beach massage under gazebos, traditional Indian massage, shiatsu and ayurvedic, Mauritian and Swedish massages. The spa has two treatment rooms. You can choose to have your massage on the beach or in the spa. Please note that children under 12 years old are not allowed in the spa without adult supervision. There are several spa treatments such as facial, body scrubs, and body treatments (body scrub, mud bath or honey bath) that are available. At the Laguna Beach Hotel & Spa you will be pampered by the numerous complimentary activities. Enjoy the adrenalin rush and fun time with the many land and sea activities such as: boathouse, pedalos, kayaks, glass bottom boat, windsurfing, snorkelling, beach Volley, pool table, table tennis, and indoor games. There are also other interesting activities which are available at supplement. Activities such as: para-sailing, water skiing, tube & banana rides, boat trips to GRSE Waterfalls & to islets (Ile aux Cerfs, Ile aux Aigrettes, Ile au Phare, Ile de la Passe, Ile aux Deux Cocos), Blue Bay Marine Park; sunset cruise on Catamaran or Pirate sailing Boat, under sea walk, scuba diving, deep sea fishing, bicycles, fishing expeditions on a pirogue (traditional boat) accompanied by local fishermen, and golf course (within 3 km). Night musical entertainment - Sega shows on Saturdays, and cultural shows on Wednesdays. Children can spend a fun and creative moment together with other children. The staffs are always here to entertain the kids. There are various creative programs that have been designed for kids on holiday at Laguna Beach Hotel. Golf Unforgettable is the only word to describe around of golf on the course at Paradis Hotel. Set against the backdrop of majestic mountains, the fairways and greens curl along the shoreline of a spectacular bay. The claim that this is one of the most beautiful golf courses in Mauritius is a valid one. Built within the resort's grounds, the 18-hole Par 72 golf course stretches along 5,924 meters between the iconic Morne mountain and the crystal-clear lagoon of the Morne peninsula. Much of the creative design of the bunkers and fairways is attributable to international golf legend Tony Johnstone who has spent several years playing the course through its many evolutionary stages. Carved into the rugged south-west savannah land coast of Mauritius, between mountain and sea, Tamarina Golf, Spa and Beach Club is the first residential golf estate on the island. Tamarina Golf, Spa and Beach Club boasts 119 luxury villas, an 18-hole par 72 challenging Championship golf course designed by Rodney Wright, a Golf Academy, tennis courts and a clubhouse with a Pro Shop, a bar and a restaurant – Le Dix-Neuf. Playing 6886 metres from the Professional tees, the course is laid out with standard four par 3’s and four par 5’s with remaining holes as par 4’s. Each hole offers five different teeing options, catering for all level of golfers: Professional, Championship, Club, Senior/Ladies Championship and Ladies tees. A fantastic 300-metre practice range is also provided with large putting greens and chipping and bunker facilities. Due to the climate and the nature of the terrain, golfers are encouraged to use golf carts throughout the course. Over 6km of concrete golf cart paths have been designed for the comfort of the golfer and a halfway snack House is found between the 9th and 10th holes for refreshments. This unique Estate is not only a haven of peace but also a golfer's dream with gentle breezes and the lowest average rainfall of the island! Tamarina Golf is situated near Tamarin village, 25 km south of Port Louis and 45 km by car from the airport. Le Morne is very famous today, and everyone agrees that its One Eye spot is the best kite surfing spot in the country, and some would even argue that it is the best in the world! As a matter of fact, semi professional and professional kite surfers from the whole world come to live the One Eye experience. This site can be exposed to smooth, extreme or strong winds, waves and currents. Kite surfing there gives the opportunity of having amazing panoramic views over the turquoise lagoon of Le Morne, as well as the imposing Le Morne Brabant mountain, just next to the spot. The sailing area hosts various hotels that give all facilities for kite surfing experience. The tides at One Eye are higher during summer, especially between December and April, and the depth of the water will depend on the waves. Le Morne spot however does have a few hazards that have to be avoided, namely some large rocks. They is however clearly visible through the water. The drawback at Le Morne spot however is that it attracts a lot of kiters, especially at week-ends where there are swimmers as well. It can thus be very crowded. Moreover, it can be challenging for beginners due to strong currents that can take them by surprise within seconds and pull them outside the lagoon. It is thus advisable that beginners consider the 16 other spots around the island. Port Louis, capital and main port of Mauritius was founded in 1735 by French governor, Mahé de Labourdonnais. Its residential population of above 150,000 is an intense intermix of races and cultures. Being a vibrant spot, it receives many visitors during daytime - commuters, locals, businessmen and tourists. Shopping and a visit to the city museums can be a very interesting way to learn about the historical and cultural aspect of the island. The ‘bazaar’ (or central market) is located near the harbour on Farquhar Street. It opens everyday from 6am. In the colourful and bustling central market everything can be found, from food to clothing. In summer, it is advisable to visit the market early, before the heat of the day. 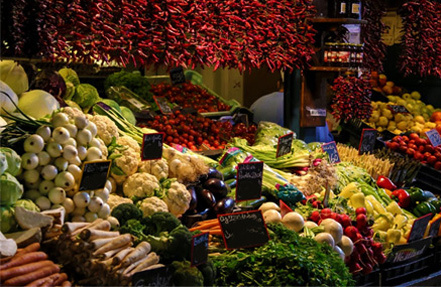 The market is divided into the vegetable, fruit, meat and the craft sections. A variety of tropical fruits, local food and crafted objects are sold at affordable prices. Calling out to passing customers, the vendors offer almost unlimited products and services and if you have good bargaining skills, then you are in for a treat. There is also an area where local snacks and drinks such as dholl puri and alouda are sold. If your stomach is sensitive then it is recommended not to try them. As you stroll around you will encounter many shops selling an eclectic range of interesting items such as clothes, hats, bags, accessories, souvenirs and many other items. Caudan, built on the old docks on the sea front, is one of the biggest shopping malls in Mauritius. It comprises of more than 170 shops, restaurants, a casino, cinemas and a 5-star business hotel. You will also find international brands, a collection of local souvenir shops and the Blue Penny Museum which hosts two of the rarest and most expensive stamps in the world. The Blue Penny Museum hosts a selection of maps, photographs and engravings from different periods in history. It also has a gallery for temporary exhibitions and a souvenir boutique. The pride of the museum's collection lies in two of the world's rarest stamps: the red one-penny and blue two-pence 'Post Office' stamps. The stamps were engraved and printed locally by Joseph Osmond Barnard. In September 1847, Mauritius was the first British colony and fifth country in the world to issue postage stamps. The stamps were incorrectly printed with the words 'Post Office' rather than 'Post Paid'. These stamps now rank among the most valuable in the world. Chinatown is a small area within Port Louis made of mostly Chinese restaurants, Chinese shops and other small businesses. Its cramped shops sell practically everything. Many hawkers sell Chinese foods as well. 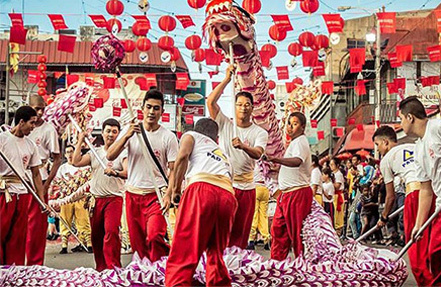 The elders of Chinatown still wear traditional dress and speak with a strong Chinese accent. Port Louis’ most imposing boulevard, Sookdeo Bissoondoyal, lined with royal palm trees leads up to Government House. Outside stands a typically solemn statue of the British Queen Victoria representative of Mauritian history. Some huge flame trees give shade to the entrance. Mauritius is one of the Commonwealth countries with the oldest democratic tradition. Fort Adelaide, or La Citadelle, named after Queen Adelaide, is situated on a hill overlooking the city and the harbour. It is at 240 ft. above sea level. The fort was built by the British around 1835 for the strategic purpose of guarding the harbour against enemy attacks and fires that broke in the city. The British are thought to have built this fort in fear of a civil war from remaining French settlers on the island. There is an underground tunnel that links it with the harbour. Out of the four forts built in Port Louis it is the only one to have not ended up in ruins. Its black stone walls conceal the interior renovation work in progress since the early 1990s. Fort Adelaide was a fitting symbol of British strength, but the great building slowly decayed over the following one and a half centuries. It is now being transformed into a site of recreation and tourism. Founded in 1812, Champ de Mars is another interesting place to visit, especially during the horse racing season. 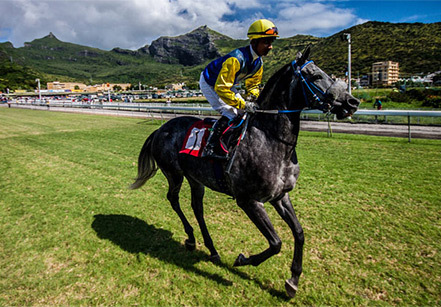 Situated in Port Louis, it is the sole horse race-track on the island. It is the oldest race course in the Indian Ocean and the second oldest in the southern Hemisphere. As the most popular sport in Mauritius, a high level of professionalism has been reached in the organization of races over the last decades, thus, boosting competition levels, and creating a unique electrifying atmosphere on each race day. This is a great tourist attraction as well. You can expect around 30 000 visitors per race. The first race-meeting usually starts in mid-May and ends normally in late November, with an average of nine horses per race. On average, some 60 horses participate on each racing day. Since the early 1990's, the Totalising System has been introduced and various betting combinations are now available. The standard of horses in Mauritius may not be as high as in Europe or U.S but the atmosphere during a race-meeting is definitely as exciting as anywhere else in the world. The small Photography Museum is the labour of love of local photographer Tristan Bréville. He’s amassed a treasure trove of old cameras and prints, including several daguerreotypes (the forerunner of photographs) produced in Mauritius in 1840. The museum also contains a vast archive of historical photos of the island, only a tiny fraction of which are on display. This fascinating museum has one of the island’s oldest display of cameras prints and photographs of colonial Mauritius. Exhibits include an impressive glass-plate camera from 1880 and some wonderful archived photos, copies of which can be bought as souvenirs. You can discover more than 1000 photo apparatus, ancient photos, albums, photo frames, and if you are lucky, a Daguerréotype. This museum full of memories is definitely a place not to be missed. The Natural History Museum, the oldest museum in Mauritius, is found at the centre of Port Louis. The Museum collection dates from early 1800. It contains unique, rare and even extinct specimens of the fauna of Mauritius and surrounding islets. The natural history museum is free for everyone. The only downside is that you need to have a very good memory as visitors are not allowed to take pictures. It does not have air conditioning, so it is advised to visit on a cool day. The most popular exhibition is that of the Dodo; its skeletons are on display. The museum is also a nice day out from the bustle of the capital; one can also learn about nature and marine life. Nestled majestically in the verdant Yemen Reserve in the Black River district, this glorious nature and animal park is a must see place in Mauritius. Spread over 250 hectares of rugged terrain, lush forest, scorched-earth safari and breath-taking gorges, the Casela Park hosts an eclectic range of indigenous and exotic species such as Java deer, wild boars, hares, macaque monkeys, big cats, rhinos, giraffes, camels, zebras, ostriches, mongoose and fruit bats, as well as ebony, pink pepper plants, and the list is just endless. Here, you will have the privilege to discover a whole new world of the mountain, nature and safari kingdom. Besides, encountering the fascinating animal species, you have the choice to plunge in the world of adventures through various adrenaline-packed activities in the wild nature like engaging in Safari Quad Biking, photo-safari with the big cats and African mammals, canyoning, zip lining, Nepalese bridge, toboggan slide (adults and children) and 4D Cinema to discover the natural science and history of Mauritius. The 19th century immigration depot is a UNESCO World Heritage site that has a historical and cultural value to the Indian Diaspora in Mauritius. The Aapravasi Ghat is a historic complex of buildings located on the seafront in Port-Louis. It consists of the partial remains of three stone buildings built on the spot of an earlier depot site. It has an entrance gateway, a hospital block, remnants of immigration sheds, and vestiges of the service quarters. The complex represents the beginning of the Great Experiment initiated by the British Government, where nearly half a million Indians were housed between 1834 and 1920. They were the first “indentured” labourers, brought to Mauritius by the British Government to work on sugar plantations after the abolition of slavery. The highlight of the site is the Beekrumsing Ramlallah Interpretation Centre, which hosts children activities. To get into the depth of the Mauritian historical and cultural legacy, a visit to the Aapravasi Ghat is recommended.